The Western Australian Academy of Performing Arts’ Bachelor of Performing Arts (BPA) course has been running for just six years but its impact is already being felt on the independent theatre scene. Case in point? Local theatre company Rorschach Beast will present Hive Mind at the Blue Room Theatre this May, a production that involves three BPA graduates and one BPA final-year student. Nina Levy caught up with Hive Mind cast member and 2017 BPA grad Charlotte Otton to find out more about the upcoming show and the WAAPA course that’s producing such accomplished alumni. Nina Levy: You’ve just graduated from WAAPA’s Bachelor of Performing Arts course… what were you doing prior to that? Charlotte Otton: I’m originally from NSW and I flew from Sydney to Perth in 2015 to study. Before I came to WAAPA I was heavily into the comedy and improvisation scene in Sydney. I lived in a studio in Chippendale that my friend converted into a four-bedroom apartment… my window opened into the living room, so it was very much ‘trash-chic’. I studied improvisation with Impro Australia and the crew from Improv Theatre Sydney; we did shows above pubs and university bars. In 2014 I studied in Chicago at Improv Olympic and got a short scholarship to study sketch writing at Second City. On the off days that I wasn’t doing improv comedy I was probably working numerous horrible café jobs or doing classical voice training at the Conservatorium (if anyone needs an opera singing improviser, I’m your gal). NL: And the Bachelor of Performing Arts – it’s a relatively new course so can you tell us a bit about it? CO: Yes! The course is only six years old and it’s headed by the incomparable Dr. Frances Barbe. The course essentially gives you the tools and skills to become a working independent artist. You study devising, directing, writing, movement, acting, voice, technical theatre, puppetry, site-specific work, arts management and more… you get your feet wet in all facets of the arts. The course is strengthening every year thanks to the bevy of boss women at the helm: Tamara Cook, Samantha Chester, Angela Punch McGregor and Frances Barbe. I’m really thankful to have studied there and learnt what I have – it’s completely shifted and inspired the artist I’m working to be. NL: So how did your artistic goals shift? 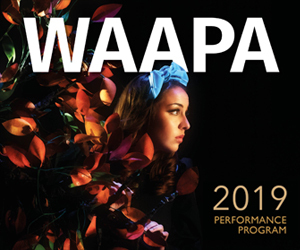 CO: I always saw myself as a comedian or a vocalist before WAAPA. I still love both of these things and they both definitely inform the work I currently make, but my goals have broadened. They all essentially fall under the guise of ‘theatre maker’ now. What shifted for me the most in those three years was understanding the vigour and determination it takes to be a paid working artist and the need to stop categorising my art as a ‘hobby’. CO: I’ve been a fan of Rorschach Beast ever since I saw the company’s debut show, Girl in the Wood, in 2016. It’s clear that both [founders], Geordie Crawley and Izzy McDonald, are great theatre makers who excel in sharing stories with heart and depth. Despite the numerous accolades they’ve been awarded as a company (WA Melbourne Fringe Tour Ready Award 2016, Martin Sims Award 2017, to mention a few), both head creatives honour their artists and the work they make. I believe that sort of love and support is the main ingredient in making good theatre. I also joined The Big Hoo Haa improvisation troupe in 2016, an ensemble of which Geordie was already a member. We both became really close through rehearsals and Saturday shows and eventually, through Geordie, I met Izzy who’s also now one of my best friends! CO: Hive Mind is set in the town of St Augustine where a girl named Hayley Woodward goes missing whilst hiking through Box Elder Canyon. Whilst detective Dale searches for the missing girl, his boyfriend Austin becomes obsessed with a beehive he was gifted. Austin believes the hive grants him insight into the true nature of the universe. The pursuit for Hayley is ongoing whilst Austin becomes more and more committed to the hive and his beliefs. Hive Mind looks at strength in community, the conflict that faith brings, and the dichotomy of love and obsession. I play Kate, a detective who’s recently come back to her old town to help find Hayley Woodward. I see Kate as a woman with a strong exterior but who’s also highly susceptible to external forces and people that have come and gone in her life. I resonate with her because she thinks and feels deeply and sometimes lives a bit too far in her own mind. NL: Beyond Hive Mind, what are your plans for post-uni life? CO: Since officially graduating in February this year, I’ve started a month-long artist’s residency at Fremantle Arts Centre where I’ve been creating a show about female sexuality and empowerment with four other incredible artists. The show is called Let me finish. During the run of Hive Mind, I’ll also be starting rehearsals for an exciting project with Spare Parts Puppet Theatre and the WA Symphony Orchestra which I’m really keen for. All other 2018 pursuits are still in the air for now, but so far it’s been a pretty exciting year! CO: Hard one. I’m going to have to go with adult sized swings. You really can’t beat being in a swing as an adult. The old playground near the house I grew up in Gosford used to have a set of three upright wooden logs. These logs had a series of foot holes running up to the top and those logs were pretty spectacular. They were extremely basic and not at all fun but it definitely filled in the time. Other than climbing some wooden logs there wasn’t much else to do in the town of Gosford in the early 2000s. Hive Mind plays the Blue Room Theatre, 1-19 May. Top: Charlotte Otton as Kate in Hive Mind. Photo: Marshall Stay.